This week, I sat down with Double-A Reading pitching coach Steve Schrenk, who spoke about his team pitching staff, including Shane Watson, All-Star Drew Anderson, Victor Arano, Austin Davis and Cole Irvin, who is already enjoying success in the Eastern League one year after making his professional debut. This marks the third interview this week with Phillies' organization developmental pitching coaches. 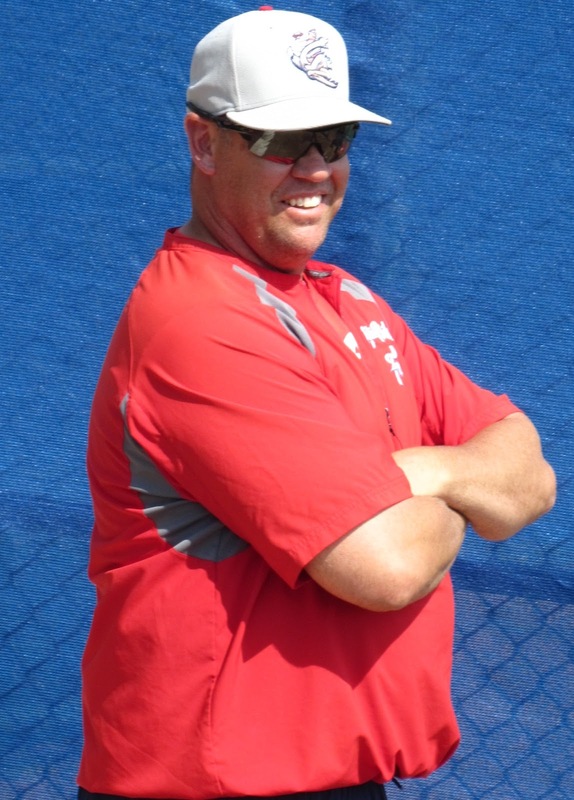 My interview with Triple-A Lehigh Valley coach Dave Lundquist can be found at this link, while my interview with Class A Lakewood coach Brian Sweeney can be viewed at this link. -I want to ask you about several guys. First guy that pops in my mind is Shane Watson, who went through a transition, moving from the starting rotation to a relief role. He's been successful there, outside of one outing maybe. Can you talk about that switch for him? It's been great so far. It's something he wanted to do, so that makes it even easier for him. I think he likes coming out and being available every day, at least every other day and pitch and throw a fastball and a slider. His velocity's bumped up two to three miles an hour, which has been great for him. I just think it fits his personality and I think he does too. I think it's been great. He doesn't let anything bother him and he's in attack mode. He's done a good job, so it's been great. -On that sort of change, a lot of times you might hear or read fans and media types clamoring for trying a guy in a different role. "They gotta try Mark Appel in the bullpen! They have to get Shane Watson out there!" Or, "They need to move this other guy!" Does the organization think about it that much and when those changes are made, how much debate or thoughts goes into moving a pitching from starting to relieving? There's a lot of thought that goes into it and we gave Shane a lot of opportunities to start. When you have good, big, strong arms, you want them to start. I mean you want guys that are durable that can go a long time. Mark Appel's a big bodied guy that can throw the fastball for a long period of time. Shane was too, a high school kid that got bigger and stronger. But at some point if the third pitch doesn't come along, whether it's a curve ball or a change up and you only have two pitches, you've got to make a transition to go over to the bullpen. And I think personality has a lot to do with it. You'll hear me say that a lot. I think the personality of a kid, if he can handle it. If he's able to the adversity every night, or not doing well. That's a big part of it. -Vicor Arano joined the club during season, back from the disabled list. What have you seen out of him this season? He's been doing well ever since he got back. He had some arm troubles in spring training. He's been up here, he's been doing well. I have him on limitations, because of his arm trouble, but I mean, one day on, one day off. Two innings, two days off. So, I mean, he's doing a great job. I think he's doing as well as I think we thought he'd do, from last year. Again, another guy that started, ended up in the bullpen. Do I think he can start? I mean, we'll see how his arm-- He's a big, strong kid too. I think right now, he likes where he's at and it's a good role for him, but he's been tremendous for us. 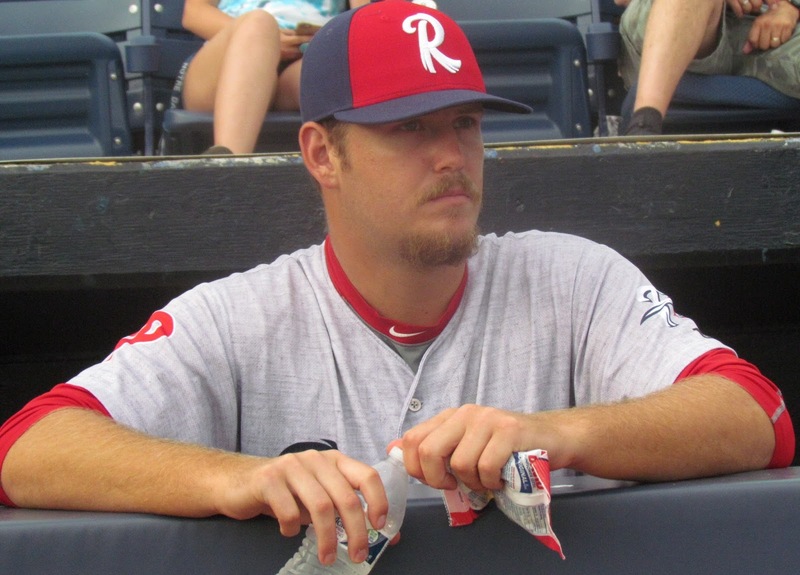 -Drew Anderson is a talented starter for the Reading team. I talked to him recently and he seems really focused on helping the team win and not much else. Can you share some comments on him? Drew's been doing well. Obviously, he made the All-Star team. He's had a little bit of a rough start. I don't think it was the start that he wanted, but I think transitioning to Double-A and getting to where he's at and using all his pitches, he's come along just like we thought he would and he's becoming the pitcher-- he's probably gonna be in the big leagues. He's still got some work to do. He's still got some pitches to work on and some game calling, but I think he's in the right place for where he's at right now and he's headed in the right direction. Rios last year struggled with command and confidence. The double C's. But this year he's been great. He's got both of them. The confidence is back. His arm slot's a little higher than what it was last year and I think just him coming back here knowing what he was getting into in the this league has helped him a lot. I think the confidence is the biggest thing. His stuff is the same. He's gotten better with his slider and he's got a good fastball. He's 95 to 98 with it. He just needs to stay healthy and keep pitching and continue on the track that he's on. -When pitchers here add those miles per hour, is there a contributing factor to it that you think is the main reason? I know a lot of guys with do throwing motion exercises with towels and side work that helps with strengthening, but is there any big factor that you notice that helps the most? You know what, a little bit of credit to Rafael Chaves, our coordinator, and we all as a group and as a staff have been working on our lower halves, using our lower half and learning how to lead with our hip I guess you would say. Lead with our legs. Letting our legs to the work and letting our arms follow. It's helped. It's helped a lot of guys. We've had a lot of guys actually bump up their velocity. So I think we've seen that over the past couple year, what we're doing with guys with what we're working with guys-- with long toss, with the towel work and throwing sides and all that stuff, but at the same time, they're doing it properly and they're using their legs and we're saving some arms and we are seeing an increase in velocity. So, it's been good. -Do other team or other organizations focus on the same work or what percentage or other teams do a similar amount of extra work? Teams do the bull pens, they do all the workouts, they do all the running and stuff but I think we take it to another level as far as doing some of the towel work and getting on the mound everyday. Not throwing every day, but getting on the mound, working on our deliveries. I don't see as many teams getting on the mound, everybody, everyday. But that doesn't mean they're doing it when I'm not around. But I think for the most part, baseball is baseball, but I think the Phillies are in a class of our own as far as using our lower halves and utilizing what we know and what we can teach. -I neglected to ask you earlier about Alberto Tirado, joining the team this week following a promotion from Clearwater, who is also a former starter, gone to the bullpen. You may not have seen much of him, but what are your thoughts on him? I haven't seen him throw this year. From the reports that I got, I know he's been doing a good job. I know he'll be going in our bullpen. Again, didn't quite come up with that third pitch. You need three pitches to start in the big leagues and that's where he wasn't. He's got a tremendous slider and he's got a good plus fastball. So, I mean it's just a matter of him going out there now and learning how to pitch. And I always thought, in my mind, that he was going to be a reliever, but you know what? We tried starting, and a big arm, to see what happened. Like I said, your big arms, you want them to start, and, so I think this is the right fit for him. I think his personality fits in the bullpen too. The way he is, being around him when he was younger. We'll see what happens. I haven't seen him throw at this level, so time will tell. -Austin Davis has been great out of the bullpen for you guys. He's had plenty of success this year also. He's doing well. A left-hander that's come through our system. He started a little bit, is in the bullpen. A left-handed guy. He's gonna contribute to the big league club some day. Hopefully sooner than later. He's been doing a nice job. He's still gotta work on some things, command and pitches like that. But he's doing a good job. It's been nice to see him come up here and do well. The nice thing about him is that he's done it at every level and he's proven himself. -Cole Irvin has been a fast riser since in the system turning pro last year. What have you seen from him thus far? I've seen him two starts. I like the way he attacks hitters. He reminds me of Cliff Lee with the way he pitches and the way he goes after hitters. He's very aggressive. Here it is, hit it! And here's my best stuff. He shows a good slider and a good curve and fastball command has been off the charts so far and he shows a good change up. So, there's some good pitches there and now he's got to learn how to throw them, when to throw them. But I think at every level he's going to have some success. He's left-handed, and like I said, I like the way he goes about it. I like the way he works and I compare him to Cliff Lee the way he attacks hitters. He's not afraid of anybody. -I want to show this roster I have to you. Out of guys I haven't mentioned, is there anybody you would love to share some thoughts about? Tom Windle's been doing an excellent job as of late. Tom's struggled the last few years here. Now he's starting to pitch. He's learning how to pitch. He went down and worked with Roy Halladay for a couple weeks and he's come back and been a different guy. So, tremendous job what him and Roy are doing on the mental part of this and so far I've seen some really good things. (Ranfi) Casimiro's been doing a really nice job. He's been kind of pitching back and forth out of the bullpen and starting, so again, to (his) credit, he's got to show everyone at every levelbut o far with his height and the way he's doing stuff, great mix f pitches, he's been fun to watch.